Good Ole Blenheim Ginger Ale is an incredible cocktail mixer. Our kicked up blast of ginger flavor takes any drink to the next level. 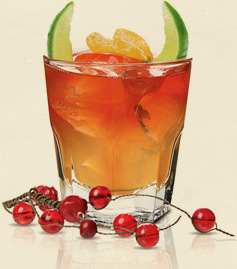 Our feature drink this time is the El Diablo, which was invented by Victor Jules Bergeron Jr. who founded Trader Vic’s. Trader Vic’s is a Polynesian-themed restaurant chain that began in the 1930’s in Oakland, California. They are also the originator of the Mai Tai cocktail. The recipe for the El Diablo can be found in their cook book “Trader Vic’s Book of Food and Drinks” published in 1946 by Doubleday Publishing. Squeeze the half lime into a highball glass and then drop the spent half into the glass. Pack with cracked ice and then add the tequila and crème de cassis. Stir gently. Top with our spicy ginger ale and enjoy responsibly. Fans on the Blenheim Ginger Ale Facebook Page were the first to get this great offer. During the holiday season of 2013 we will include a free t-shirt when you order a case of our spicy ginger ale. Join us on Facebook so you can get the latest offers, news and updates about Good Ole Blenheim. If you need to find Blenheim Ginger Ale near you, our Store Locator is a great tool. You can also order our spicy ginger ale from the Blenheim Online Store. Do you have a favorite drink, food or cocktail recipe that make with one of our spicy ginger ale products? Leave a comment below and we might feature it in an upcoming blog post. This entry was posted on Tuesday, December 17th, 2013 at 5:48 am	and is filed under Drink Recipes, News & Press, Recipes. You can follow any responses to this entry through the RSS 2.0 feed. You can leave a response, or trackback from your own site. While pregnant I was looking for a great drink to substitute for a cocktail or glass of wine. I absolutely fell in love with the spice of Blenheim’s hot Ginger Ale! I like to mix it in a tall glass, about half and half with either tonic or Fresca. It makes for the perfect Mocktail!! !